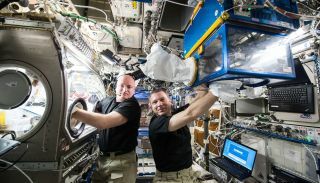 NASA astronauts Scott Kelly and Terry Virts conduct Rodent Research investigations within the Microgravity Science Glovebox and the Rodent Habitat Module aboard the International Space Station. Being an astronaut is a tough job. Not only do they work long hours in a confined spot, but their entire body deteriorates in microgravity. Astronauts spend more than an hour exercising every day. Yet they still see declines in muscle mass. After six months in space, astronauts usually need help walking when they return to Earth. It takes months of physiotherapy to get back to normal. If astronauts fly to Mars in the 2030s as proposed, muscle problems will be a big deal. How can an astronaut set up a habitat after spending months and months in a spacecraft, flying to the Red Planet? What if they fall and break a bone? How will living in the lighter gravity of Mars affect their ability to live normally on Earth, after they come home? NASA is still working on the answers to these questions. But there's one potential aid: Perhaps astronauts could take a medication to reduce muscle deterioration. It's already being tested on the International Space Station with mice. Forty rodents, each equipped with a special skin implant that automatically delivers medication, flew to the orbiting complex aboard a Dragon spacecraft in December. Half the mice came home in January, and the other half will return home this month. Testing is in progress on the experiment — called Rodent Research 6 — to see how well the mice reacted to the drug. In an interview, principal investigator Alessandro Grattoni cautioned that the device isn't approved yet by the Federal Drug Administration, so it will be several years before astronauts can test it. But he expects that's plenty of time to get the device ready for possible Mars missions, as long as the development money is available. Administering medication "is cumbersome for the astronauts," said Grattoni, chair of the nanomedicine department at Houston Methodist Research Institute. "Sending a device that does the work for an astronaut … would be beneficial," he added. That's not the only benefit. The device would work for people with wasting muscle diseases, perhaps for patients forced to rest in bed for months after a surgery. It also is being approved right now to administer medication for HIV prevention, where a single missed dose could mean a lifetime of unpleasant consequences. Grattoni expects the HIV version of the implant will be approved in as soon as three years, after its clinical testing finishes. His team is also working on a newer version of the rodent implant experiment that should fly to the space station in 2019. This version will allow for medication injection by remote control. On Earth, Grattoni said, this version of the device will be very helpful for patients living in remote communities. After a phone consultation with a doctor in a big city, the doctor could adjust the medication dosage using Bluetooth or an Internet connection. For both astronauts and patients, Grattoni's device provides several other benefits. Medication is administered continuously and smoothly, avoiding the spikes that can lead to people experiencing nasty side effects. No one can forget to take their dose. And the device, which is like a membrane, doesn't need to be replaced very often. Patients will instead only need to go to the doctor's office every 6 months to 12 months to get a medication refill. That will be especially handy on a Mars mission, which could take 18 months to two years to complete. Grattoni said, "This a very exciting new development that offers promise for treatment."